2011. China. 72 min. Digibeta. English subtitles. Recycled cooking oil is known as “di gou you” or “gan shui you” in Mandarin Chinese and has been translated into “gutter oil”,”sewage oil”, or “drainage oil” in English. It first appeared in the Chinese vocabulary roughly a decade ago, when unlicensed production began to exist. This inferior form of cooking oil contains carcinogens such as aflatoxins; it is both unhygienic and unsafe for consumption. China uses a massive amount of cooking oil every year. Although official statistics are unavailable on the website of the National Bureau of Statistics, 29.3 million tons of vegetable oil was forecast as the total amount of consumption for 2010 to 2011, an almost 9% increase from 26.85 million tons for 2009 to 2010, compared to 22.5 million tons for 2006 to 2007 (Agri Commodity Prices). In 2010, 15% of the total was estimated to go into waste (Xinhua). And out of that amount, 10  20% is said to be legally recycled and made into biofuel, while the remaining would likely end up in the hands of underground cooking oil recyclers, who would process it and then sell it back to Chinese restaurants (Telegraph). Because the net profit of such recycled cooking oil was nearly 200% of what it cost, it was an extremely lucrative business (Xinhua). Concerned with the badly polluted city that he called home, Chinese freelance photojournalist and independent filmmaker Wang Jiuliang began an investigation of all of the landfill sites in Beijing in October 2008. His project lasted two years, during which time he also came into direct contact with some cooking oil recyclers on the outskirts of Beijing and captured them on camera. Responsibly speaking, Beijing’s pollution and its attendant problems were indeed bigger and deeper than they seemed. Now his documentary Beijing Besieged by Waste (2010) on the investigation has been completed. It was screened for the Foreign Correspondents Club in China on October 13, 2011 at the Embassy of Poland in Beijing. It was on the China Next (CNEX) Campus Tour in Canada last month. It screened once at Beijing’s art house movie theater, Broadway Cinematheque MOMA (BC MOMA). And as of right now, it is playing at the Abu Dhabi Film Festival (Oct 13-22). Below are some of my thoughts on the film and information that I have gathered about it. A lot is packed in the comments, but the ideas should be clear  Wang is a socially conscious artist who uses art for grassroots activism. As mentioned above, Beijing Besieged by Waste (2010) began in October 2008 and was finished in October 2010. During this time, Wang Jiuliang traveled 15,000 kilometers all around in Beijing, visited roughly 500 landfills, and taken 10,000 stills plus 60 hours of raw footage. What sounds like a mammoth project was diligently carried out by Wang step by step. 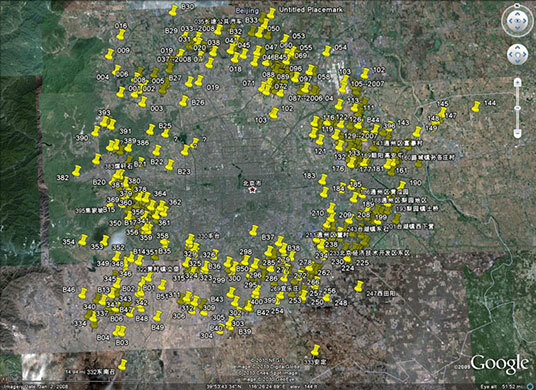 Here is his famous Google Earth picture of Beijing. For the most part, the documentary is organized chronologically. After the first sequence of a landfill site slowly being engulfed in thick dust and fog after a trash truck arrives, the title card introduces us to Wang’s endeavor. A sequence of images then show us a fast growing and expanding Beijing, and next we get to see the trash collecting station in his apartment complex, which acts as a segue to the real underbelly of the city. From there, the world of trash opens up. Guided by his own narrative throughout the documentary, including how he discovers the true identity of some black stuff, which he also refers to as “black crap,” we embark on this investigative journey with him, and a sense of urgency lingers over the film. Wang concocts his observations using both stills and moving images, and he sutures them together using different kinds of documentary features. These include Herzog-style voice over narration, interactive dialog that serves as informal interviews, diegetic music (China’s national anthem played at Tiananmen Square), as well as added music soundtracks throughout the documentary. He appears in the documentary a dozen times too. For instance, one time, he and his assistant cameraman both bend their heads and check the lens of their video camera after some pig fodder seems to have spilled on it. The inclusion of this shot in the documentary is deliberate. Moments like this are meant to remind viewers that not every shot in the documentary is staged. While he and his team could probably search for the best angle to capture a colorful trash mountain or a gloomy trash trench, there are times that they just have to do it guerrilla-style – they dive right in a situation and make the best out of it. That said, some shots in the documentary are beautiful despite the fact that they are about trash. We do not if someone has actually put it together, but when the wind blows on layers of colorful plastic bags rested on barb wires, they appear both strange and good-looking, and they remind me of Tibetan prayer flags too. Another shot that tracks the smoke coming out of burning trash also looks impressive. It is a full low-angle shot that looks up at the sky, which I want to call a dome shot, of the smoke. If it had lasted longer than ten seconds, I would say it was mesmerizing. Besides these inanimate objects, Wang makes the documentary fun to look at by including diverse subjects too. There are cows, goats, dogs, and pigs living in this world. There are also happy-playing children and jovial and chatty men and women, in contrast to the majority of quiet and hardworking scavengers who labor in sweat. Some women casually ask Wang not to film them because they do not look nice picking trash. Wang probably disagrees with that. He still shows them in the final film and allows their voices to be heard. As a matter of fact, seldom would they be heard. Many good contrast scenes also exist in the documentary. Nights contrast with days; shiny police cars contrast with dirty dumpsters; wedding couples contrast with ragged trash scavengers, etc. Viewers can easily relate to Wang in these places because he tells his reactions plainly. He is not being hypocritical; he just observes like we will and he reacts. We do not know if Chinese government officials have had the chance to watch Beijing Besieged by Waste (2010) in China, but it seems that they have appreciated citizenry concerns and actions over environmental problems in Beijing. Wang’s photography exhibition of this project was held last April, and it received considerable recognition from within China. It is stated at the end of the documentary that the Beijing municipal government has planned to invest 10 million yuan ($159 million) in treating waste disposal sites in Beijing over the next five to seven years. Certainly, Wang Jiuliang has done his part to raise awareness on this issue. The next round of actions must be carried out by the government. This entry was posted on Friday, October 28th, 2011 at 12:26 pm	and is filed under China Today, dGenerate Titles. You can follow any responses to this entry through the RSS 2.0 feed. You can leave a response, or trackback from your own site.